MAXIM Integrated Products, represented by Arrow Electronics . has introduced the MAX8535/MAX8536, the fastest and smallest ORing MOSFET controllers to provide fault isolation and redundant power capability in high-reliability systems. The controllers eliminate high-power dissipation and reverse leakage problems associated with ORing diodes. The simplicity and robustness of the MAX8535/MAX8536 make them ideal for redundant supplies in high-availability systems, rectifiers, and silver box power supplies in servers and networking applications. When reverse-current flow through the ORing MOSFET is detected, the MAX8535/MAX8536 isolates the failed input supply in less than 1 microsecond. Furthermore, when input under/overvoltage is detected both controllers selectively isolate the faulty supply and maintain a stable bus voltage. The MAX8535 is suitable for 12V applications, while the MAX8536 is suitable for 3.3V or 5V applications. Both controllers feature a dual-purpose programmable timer allowing adjustable soft-start or use as a logic enable. The MAX8535/MAX8536 provide lossless current sensing and offer reverse current protection, as well as adjustable over/undervoltage detection. 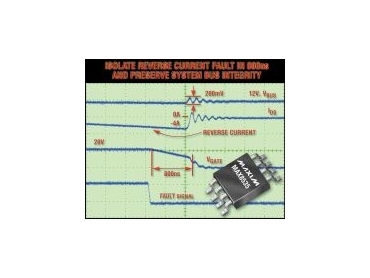 Overvoltage, undervoltage, or reverse current conditions are indicated by a versatile FAULT output. The MAX8535EUA/MAX8526EUA are available in a space-saving 8-pin microMAX package. Both controllers are specified for the extended-industrial temperature range (-40°C to +85°C). An evaluation kit is available to speed designs.